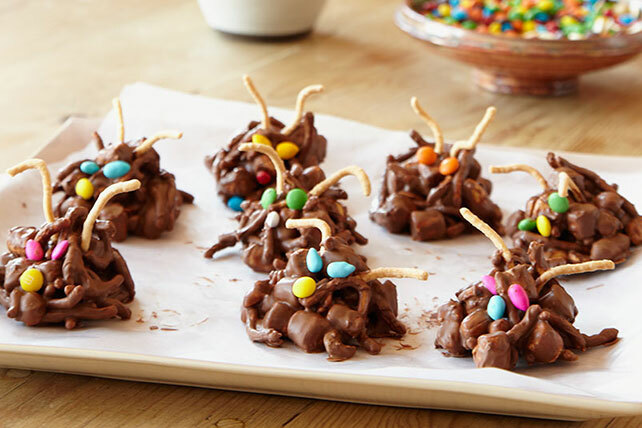 Create these sweet, savory and crunchy Chocolate Haystacks with just five ingredients. These Chocolate Haystacks come together in 10 minutes. Microwave chocolate and butterscotch chips in medium microwaveable bowl on HIGH 2 to 3 min. or until almost melted, stirring after 1-1/2 min. Stir until completely melted. Add remaining ingredients; stir until evenly coated. Drop tablespoonfuls of chocolate mixture onto waxed paper-covered baking sheet. Refrigerate 1 hour or until firm. Looking for something sweet? One serving of this crunchy treat is sure to hit the spot when served with a cold glass of low-fat or fat-free milk. Prepare as directed. Insert additional chow mein noodles into haystacks for the critters' antennae and legs. Press small colored candies onto heads for the eyes. Substitute1 cup BAKER'S Semi-Sweet Chocolate Chunks for the chocolate. Makes 3-1/2 doz. or 21 servings, 2 haystacks each.